Cindy McCain, who two weeks ago said she would never make her tax returns public, revealed Friday that she had a total income of more than $6 million in 2006. The presidential campaign of her husband, Republican John McCain, released the top two summary pages of her 2006 tax return, eager to avoid making her earlier refusal an issue in the contest. The documents show that Mrs. McCain, who files her taxes separately from her husband, paid more than $1.7 million in federal income taxes - a tax rate of more than 28 percent. She reported nearly $570,000 in itemized deductions. McCain's campaign said she had received an extension on her 2007 tax returns and aides said it is likely she would make those public when they are filed. The Arizona senator released his own tax return last month, reporting a total income of $405,409 in 2007 and $84,460 in federal income taxes. McCain's two Democratic rivals - Barack Obama and Hillary Rodham Clinton - released information about their taxes earlier. Both Obama and Clinton file their taxes jointly with their spouses, offering more detail of each family's wealth and income. Obama and his wife, Michelle, reported making $4.2 million in 2007, while the Clintons reported $20.4 million in income. Confined to only the summary pages, her released returns offer limited information. She listed $4.5 million in income from a broad category that includes rental real estate, royalties, partnerships and trusts. She also reported nearly $300,000 in salary income, more than $280,000 in dividends, and more than $740,000 in capital gains. Heiress to a large Arizona beer distributorship, Cindy McCain's worth has been estimated at more than $100 million. Her assets, as listed in McCain's personal financial disclosure, are vast. But presidential and senatorial financial disclosures only require assets to be listed in broad ranges, and many of hers are valued at simply "over $1 million." Last week, she sold off more than $2 million in mutual funds whose holdings include companies that do business in Sudan. John McCain has been a critic of the violence in that African nation. Aides said that disclosing only the summary pages had precedent, pointing to tax information made public in 2003 by Democratic presidential candidate John Kerry's wife, Teresa Heinz Kerry. 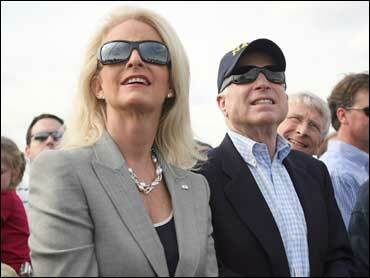 In an interview aired on NBC's "Today" on May 8, Cindy McCain said she had no intention of making her returns public. "You know, my husband and I have been married 28 years and we have filed separate tax returns for 28 years. This is a privacy issue. My husband is the candidate," Cindy McCain, wife of Republican presidential nominee-in-waiting John McCain, said in an interview aired on NBC's "Today" on Thursday. Asked if she would release her tax returns if she were first lady, she said: "No." Her response brought a prompt demand from Democrats for the McCains to be more open about their finances. Obama and Clinton have released tax information dating back to 2000. The Clintons also released their tax returns while Bill Clinton was president. The McCain's have been much more limited in their disclosures. "It is laughable for the campaign to release so little information and say they are being transparent," said Karen Finney, the communications director for the Democratic National Committee. "This is another indication that John McCain is not serious when he says he wants to run a transparent campaign, and a disturbing sign that a vote for John McCain is a vote for four more years of secrecy."